Heartfelt Tidbits has come to understand the importance of improving our clients' mental health. The maker space is a representation of that belief. In addition to the therapeutic benefits of creating art, this program allows refugees and immigrants to pursue creative entrepreneurship. Art class is held Mondays from 10:00 am - 12:00 pm at Welcome Project. Sewing class is held Tuesdays from 9:30 am - 12:00 pm at Welcome Project. Fiber arts class is held Wednesdays 9:00 am - 12:00 pm at Tikkun Farms. Sewing class is held Thursdays 9:30 am - 12:00 pm at Welcome Project, followed by open project time until 3:00. Art class and open project time is held Tuesdays 9:00 am - 3:00 pm at Welcome Project. Fiber arts class is held Wednesdays 10:00 am - 4:00 pm at Tikkun Farms. Sewing class and open project time is held Thursdays 9:00 am - 3:00 pm at Welcome Project. Interested in helping with the makerspace program? Check out our volunteer resources. At the Welcome Project in Camp Washington, makers are able to sell their creations and take custom orders. Additionally, makers employed by The Welcome Project create custom commissions for various community organizations and causes. Art classes are led by our partner, Wave Pool, who brings artists in to lead weekly adult classes and monthly children's classes. 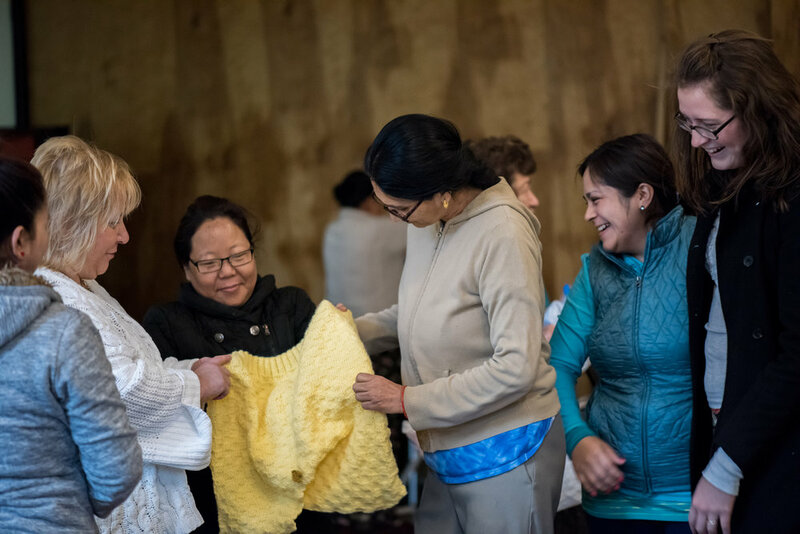 These classes cultivate a sense of community within the refugee and immigrant population, and positively impact the mental health of participants. Sewing class is hosted twice a week. Projects have ranged from tote bags to baby dresses. After six weeks, and the completion of a sewing project for a community organization, new participants are given their own sewing machine. Fiber arts sessions are hosted weely at the farmhouse of our partner, Tikkun Farms. There, refugee and immigrant artisans process raw alpaca fur, turning it into hats, scarves, sweaters, and more. All visitors are welcome to stop by our storefront or Tikkun Farms to learn about the different ways clients engage with and produce art.